Poor Mrs. Piggly. All she wants to do is to bake her adorable piglets an apple pie for Christmas. To do that, though, she needs to go into the forest to pick apples and roll them back to her cozy little cottage--and that's not exactly an easy task. 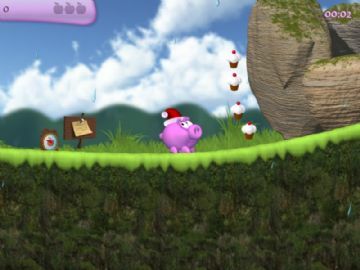 Piggly Christmas Edition is a surprise gift of challenges and fun. This beautifully crafted game opens with a clear explanation of Mrs. Piggly's dilemma, and the first level is deceptively easy. But just when you think you're in for a ho-hum experience, out come the worms, and bunnies, and mud pits. It turns out that getting these apples back to the cottage unscathed is quite a challenge. Helpful tips teach you how to play the game as you go, but they don't make it any easier. This demo seems quite generous--I played through several levels with no end in sight. The game played smoothly in full-screen mode on my XP machine, and the music and graphics were quite beautiful. One hint, though: Hit Esc to pause or quit the game. Mrs. Piggly Christmas Edition is a perfect holiday game for children and adults alike. At 20 euros, it seems like a great deal for hours of fun.